To launch a new company, you need two strategies. Twenty-seven million Americans of working age (or 14 percent of the population) are starting or running new businesses. How many of these entrepreneurs are likely to be successful? Very few. One problem is the presumption that you need a single strategy to be successful. Not true. Companies that become successful usually have two strategies. It’s like building an airplane designed to fly at 500 miles per hour at an altitude of 30,000 feet. To do that takes a certain amount of engine power and a streamlined design with minimum drag. You still have to get the airplane off the ground. That takes wheels, wing flaps and a lot more engine power than you would need at 30,000 feet. That’s the No.1 problem with many of the entrepreneurs we have worked with. They begin with the end in mind when they should begin with the beginning in mind. If you can’t get the airplane off the ground, it won’t make any difference whether or not it can fly perfectly well at 30,000 feet. If you can’t get your new business off the ground, it won’t make any difference whether or not the idea would work if it got big enough. Almost every big success started as a small success. Facebook started at Harvard, but ended up as the leading global social-media brand with more than half of its revenues from outside America. Amazon started by selling books. Very successfully, too. And now is the largest retailer on the Internet, selling almost everything. Short term versus long term. FedEx is a global package-delivery and logistics company serving 220 countries and territories. But it didn’t start that way. Federal Express, its original name, started as a domestic air-cargo carrier, competing with market-leader Emery Air Freight. Federal Express’ initial strategy: Cheaper, cheaper, cheaper. In other words, less expensive than Emery on all three services: Overnight, two-day and three-day deliveries. But it didn’t work. Federal Express lost $27 million, when $27 million was a lot of money. So what next? Many companies would have tried to expand the business in order to make money. Perhaps by adding international service. But not Federal Express. They did what every money-losing business ought to do. Narrow its focus in order to stand for something. In the case of Federal Express, overnight service. If you can’t win in the short term, your long-term future is in serious doubt. With 15 different models, Ford is the leading automobile brand in the American market. Sales in the first 11 months of last year were 2,262,493 vehicles, 19 percent ahead of Chevrolet. Henry Ford’s first automobile was the Model A, which sold 1,708 cars in the year 1903. The next year, Ford introduced three new models (B, C and F,) but managed to sell only 1,695 cars. That made a deep impression on him. So when he finally introduced the Model T in 1908, he announced to his staff: In the future we were going to build only one model, that the model was going to be Model T.
With eight models, Jeep is the world leader in SUVs, but it didn’t start that way. Jeep went into production in 1941 specifically for the military, making it the oldest four-wheel-drive mass-production vehicle in the world. Toyota arrived in the American market in 1958 and became the largest-selling Japanese vehicle brand. But it wasn’t until 31 years later that Toyota introduced Lexus which became the largest-selling luxury Japanese vehicle brand. Suppose Toyota tried to introduce the two brands together, Toyota and Lexus. Would that have worked? I think not. It was the success of Toyota that made the success of Lexus possible. Building fashion and cosmetic brands. Olay is a billion-dollar global brand with hundreds of varieties. But it didn’t start that way. It started with one product, a moisturizer called “Oil of Olay Beauty Fluid.” If Oil of Olay never became famous, the Olay brand would never have become famous either. Chanel is a $2.9-billion global brand selling clothing, watches, jewelry, cosmetics, eyewear and Chanel No.5, one of the world’s most famous perfumes. But it didn’t start that way. It started with the Chanel suit, designed by Coco Chanel. Coach is a $4.5-billion global brand selling leather goods, dresses, shoes, jewelry, watches and sunglasses. But it didn’t start that way. Ralph Lauren is a $7.4-billion global company with brand names that include: Polo Ralph Lauren, Ralph Lauren Purple Label, Ralph Lauren Collection, Lauren Ralph Lauren, Double RL, Ralph Lauren Childrenswear, Denim & Supply Ralph Lauren, Chaps and Club Monaco. But it didn’t start that way. It started with men’s ties. Estée Lauder is a $11.3-billion global brand selling hundreds of cosmetic products. But it didn’t start that way. It started with four skincare products: Skin lotion, Crème pack, Cleansing oil and Super-rich all-purpose crème. L’Oreal is a $27.6-billion global cosmetic company, the world’s largest cosmetic company. But it didn’t start that way. It started with a single product, hair dye. Procter & Gamble is a $65.3-billion global company, but it didn’t start that way. It started in 1837 as a maker of soap and candles. But the seeds of its success can be traced to what the company did in 1879, 42 years later. That was the year Procter & Gamble introduced Ivory soap. You can’t do everything at once. There are a number of companies trying to create “lifestyle” brands by doing everything at once, including Shinola in Detroit. Shinola makes watches, leather goods and bicycles today and has opened stores in Detroit, London, Miami and Los Angeles. It plans to make headphones, power strips, electronics, eyewear and homeware in the near future. Will that work? We’ll see. But history is against an all-at-once strategy. 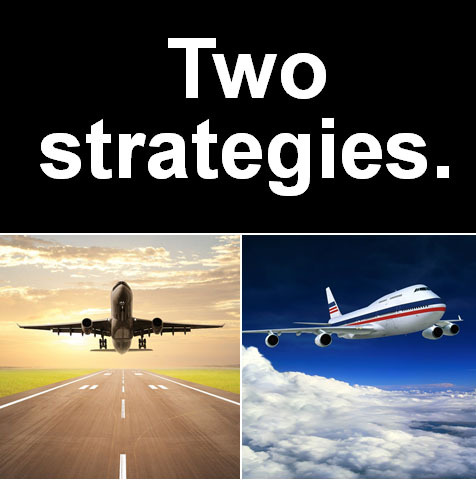 Every new brand, every new company needs two strategies. One to get off the ground and one to build a big, profitable brand or company.